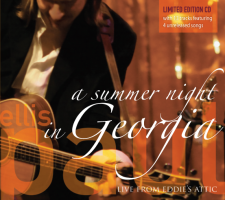 A Summer Night In Georgia is a live recording of Ellis performing at the legendary Eddie's Attic. Ellis' career grew with the help of Eddie and all the people involved with the club and quickly became a home away from home for Ellis. This album includes some old Ellis Paul tunes as well as 4 new songs not recorded anywhere else! This CD and Downloads are exclusively available through Ellis' website and at Ellis' shows.